The PRX618S-XLF, extended low frequency subwoofer was designed and engineered to provide sub bass frequencies with accuracy and power. Used as a single sub in a sub/sat system or in multiples as part of a scalable, large format sound reinforcement system, the PRX618S-XLF performs with extreme efficiency and control. The PRX618S-XLF, extended low frequency subwoofer was designed and engineered to provide sub bass frequencies with accuracy and power. Used as a single sub in a sub/sat system or in multiples as part of a scalable, large format sound reinforcement system, the PRX618S-XLF performs with extreme efficiency and control. The subs are stackable and light-weight ensuring quick set-ups and tear-downs. And due to their rugged construction are perfect for AV rental inventories. With a pole receptacle (that accepts a SS4-BK or SS4-BK24) on the top panel and integrated stereo pass-thru this is the most powerful low-frequency complement to the PRX full-range systems. The addition of a polarity reverse option further enables system optimization. The PRX618S-XLF is a high performance self-powered subwoofer system. The PRX618S-XLF is comprised of a powerful 2268FF Differential Drive® dual voice-coil and magnetic gap, neodymium woofer driven by a 1000 Watt (dual 500 watt) Crown Class-D power amplifier. Dual-Bridge Technology™ directly links discrete amplifier channel outputs to each voice coil in the Differential Drive woofer. Electrical power transfer to the transducer is optimized for more power performance. A proprietary DSP chip is at the core of a fully featured input section, providing user selectable cross-over functionality, polarity optimization, protection, dynamic limiting and discrete component optimization. The amplifier input panel offers stereo inputs with XLR or ¼ inch jack compatibility. A user selectable crossover ensures a smooth transition to full-range system connected to the stereo outputs. Signal present and limiter lights indicate the system status and assist in setting the optimum level, via the level control knob. All PRX600 cabinets are built from a combination of 25mm (on the top and bottom for added rigidity) and 18mm, strong, light-weight poplar plywood made structurally sound with tongue and groove joints. All PRX600 Series cabinets are protected by JBL’s tour proven DuraFlex™ finish. Grilles are made from dent-resistant 16 gauge steel and handles are made from light-weight glass-filled nylon for added strength and durability. The PRX635 is a self-powered, lightweight three-way loudspeaker system capable of delivering a very high level of performance over a broad bandwidth. This speaker is ideally suited to applications where the program material exhibits subtlety and nuance. Perfectly capable of reproducing high fidelity full range sound without a subwoofer, when coupled with extended low frequencies of the PRX618S-XLF, one experiences complete control over the entire audio spectrum. These cabinets can be stand-mounted but do require a large footprint tri-pod type stand. When pole mounting the PRX635 on a subwoofer we highly recommend a pole no longer than 24” (SS3BK-24 or SS4BK-24) to ensure stability and safety. As with all the full-range PRX600 Series systems two EQ selections can be used to optimize the system for the program material and/or environment. The input section also accommodates either Line or Mic/Instrument level inputs. The PRX635 is a self-powered, lightweight three-way loudspeaker system capable of delivering a very high level of performance over a broad bandwidth. The PRX635 is comprised of one 380 mm (15 in) 265F Differential Drive® woofer, a 165 mm (6.5 in) 195H horn-loaded 90° by 50° mid-range and a 2414H 25.4 mm (1 in) annular polymer diaphragm, neodymium compression driver mounted to a 90° by 50° horn, all driven by a 1500 watt (3 x 500) Audio Class-D power amplifier. A propriety DSP chip is at the core of a fully featured input section, providing user selectable system EQ, protection, input sensitivity selection, cross-over functionality, dynamic limiting and discrete component optimization. The amplifier input panel offers XLR or ¼ inch jack compatibility and a sensitivity switch provides extra flexibility, making it possible to connect literally any sound source without using a mixer. Signal present and overload lights indicate the system status and assist in setting the optimum level, via the level control knob. All PRX600 cabinets are built from a combination of 25mm (on the top and bottom for added rigidity) and 18mm, strong, light-weight poplar plywood made structurally sound with tongue and groove joints. All PRX600 Series cabinets are protected by JBL’s tour proven DuraFlex™ finish. Grilles are made from dent-resistant 16 gauge steel and handles are made from light-weight glass-filled nylon for added strength and durability. All M10 suspension points are constructed from 14 gauge steel and have been tested with a yield-strength of 1000 lbs. each. The Wild Card #5 San Dimas So-Cal Style 1 features solid alder body and topped with a veneer of quilted maple finished in Molten Crust Lava (fiery sunburst with blue back and sides). Model Switch - Give this a flick to reconfigure the destructive power of Über Metal. Metal - creates screaming distortion, from heavy grind to molten metal! Bow down, infidels. Pulverize - gives you a distortion similar to a high-gain tube amp. Mmmm, it's warm and meaty! Insane - has more skin-peeling gain and sustain than anything else available. For the inner Samurai-shredder in all of us. Level - This sets the output level. Higher levels will hit the amp or effect fed by the Über Metal will more signal level, giving your more volume. Mid & Scoop - Mid chooses a frequency from 250Hz to 4kHz. Scoop then removes sound at this frequency, with maximum scoop at the fully clockwise setting. Turn it fully counter-clockwise for a slight mid boost. Drive - This controls the amount of distortion created within your Über Metal. Especially when you've got it set high, you may need to use the Gate to tame unwanted noise. Bass & Treble - Bass and Treble are controls for your low and high frequencies. Off - Disables the Gate. Gate 1 - A soft and mild noise gate, self-adjusting to your current Drive knob setting. Gate 2 - A heavy, fast-clamping gate. Great for those aggressive metal chords and palm muting. The Marshall Bluesbreaker II is just like 2 pedals in 1, a hot boost to give your solos that extra lift, or a truly valve-like overdrive, so rich in 2nd order harmonics that it'll make you weep and wail. Having a completely passive bypass means that you don't lose a single drop of your real guitar tone too! The top-loading hard tail bridge features string saddles that are adjustable for intonation and designed to have a 9.5” radius when sitting flat on the bridge plate. The bridge is anchored at the rear of the plate while the front sits atop height adjustment screws that can be raised or lowered to achieve desired string height/action, while subtle adjustment at the rear (anchor) achieves the correct bridge angle. Custom Duncan Designed™ pickups offer tones from glassy smooth to jangly rockin’ rhythm crunch, with a vintage-tone neck pickup and higher-output bridge pickup. Other features include '62 Jazz Bass® stacked concentric volume/tone controls, vintage-style tuners and a comfortable one-piece maple neck. "New Active speaker from Biema Profesional Sound." Contact us for get the best price. "Adds power and the famous Marshall crunch to any amp"
The Guv'nor Plus is a redesigned and reissued version of the original Guv'nor overdrive effects pedal. Jim Marshall named the original unit, which is Brit slang for "the leader," or a UK musician's expression meaning "the ultimate." Like the original, the GV-2 Guv'nor Plus uses solid state technology to provide a wide spectrum of overdrive sounds. Marshall claims that this version has all the power and tone of the original unit -- and then some. This pedal will add power and punch to any amp, and is especially useful for adding the famous Marshall crunch to solid state amps, or even to perk up tube amps that can't be played at deafening volume levels. Owners of cassette and MD recording units will also appreciate the versatile tonal palette offered by this pedal. It may be just the ticket to get some warmth on recordings -- especially if you like to go direct into the board. 100+ modern and vintage stompbox effects, one at a time, in a space of a single stompbox. Supercharge your pedal board with a single stompbox! M5 Stompbox Modeler delivers 100+ gain-defying distortions, lush choruses, scintillating reverbs and other expressive effects in a single-pedal-size stompbox. Just like the classic pedals that inspired it, M5 Stompbox Modeler runs one effect at a time. But M5 is also different – it's designed like a Swiss army knife to carve out sonic creativity one brilliant effect at a time. Dare to inspire and be inspired with its complete collection of modern and vintage effects. Why buy another pedal every time you'd like a little extra spice? M5 is your buddy who's got the garage filled with half a century's worth of modern and vintage effects. But this time he'll loan out anything from the arsenal and never ask for it back. From the classic and timeless to the bold and esoteric, M5 has got you covered. This instant stockpile is robust, easily switchable and well known – it's the same effect line-up as M9 and M13 Stompbox Modelers. There are no menus, saving or hassles. M5 Stompbox Modeler is stompbox simple. Tweak your tones on the fly using the dedicated knobs. When you power down your settings remain, just like a classic stompbox. M5 costs less than a good, single effect pedal and delivers many times the firepower. It's stocked with inputs and outputs to integrate seamlessly into your pedal board, MIDI setup and live, studio and rehearsal scenarios. Stompbox simple and pedal board powerful. Order the effects any way you want. Create different pedal board effect arrangements, or "scenes," to instantly recall an entire song's stompboxes. Save a scene for your metal band, one for your Top 40 gig…you get the picture. No more tearing up Velcro® just to change one or two pedals! Save up to 48 scenes and back them up to your computer using the MIDI in/out. The 28-second looper is always at the ready with dedicated footswitches for Play/Stop, Half Speed, Reverse, Undo/Redo and more. Each metal footswitch can withstand constant stomping and rock and roll-style abuse. Easy to use, built like a tank and sporting an on-board chromatic tuner, M13 Stompbox Modeler can maximize your pedal board (or even replace it) like no other pedal can. One Portable, Great Sounding System. The Expedition 308i gives you the power to perform wherever you need it. With powerful, full-range sound in an all-inclusive portable package, the Expedition 308i is an ideal single system solution for a variety of live sound applications. A compact PA system with dual 2-way speakers, on-board mixer and 300-watt power amplifier, the Expedition 308i (XP308i) is the ultimate in portability thanks to a clever, lightweight design that allows you to connect all the pieces together into a single, easy to transport case. The internal 2 x 150-watt Class D power amplifier produces an incredibly clean and powerful stereo sound. The system's speakers are 2-way vented enclosures with heavy-duty 8-inch woofers for deep bass. These are complemented by a 1-inch titanium tweeter set in a custom horn with a 60 x 90 degree coverage pattern. The result is consummate dispersion and loud, lucid audio. The XP308i's 8-channel mixer can be removed from the speaker for tabletop use and you can use the kickstand to set the mixer at an ergonomically correct angle. The mixer features four mic/line inputs, two stereo inputs, bass and treble control on each channel input and phantom power. For enhanced convenience and versatility, the XP308i includes a built-in iPod dock, which easily connects to most iPod models for seamless music playback. With all these comprehensive features set in one portable, great sounding system, the Expedition 308i stands out as one of the most versatile and inclusive portable PA systems on the market. Though the XP308i was designed for providing quality sound reinforcement in musical settings, the dynamic range of musical settings that can benefit from the system's features is unparalleled. Whether you're a singer/songwriter gigging in a coffee shop, a full band practicing in a rehearsal space or a DJ entertaining people at a small club or bar, the XP308i will ensure your sound is well suited for your space. In addition, the system's speaker enclosures lend themselves perfectly to a variety of musical performances when being used as floor monitors. With the XP308iw, your voice will command the boardroom podium with as much authority as the stage. The XP308i provides the perfect solution for a business professional leading any sort of presentation. No matter the application (PowerPoint presentations, company meetings, corporate events, etc. ), the unit will allow you to convey your ideas in a clear, concise manor and perform your job better. Specifically relevant in such cases, the XP308i's integrated iPod dock enables your MP3 player to playback audio clips in promoting a more interactive listening experience for any audience. 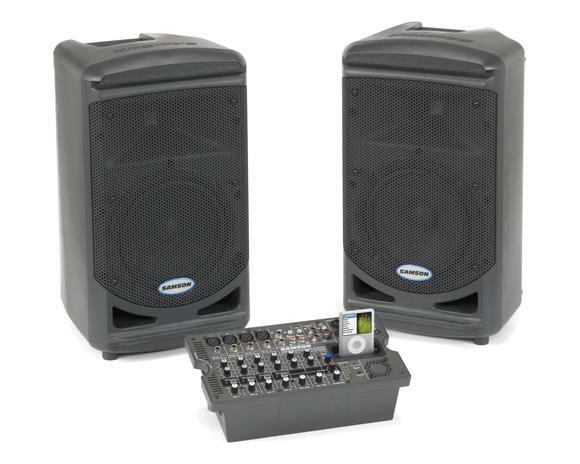 In addition to all students, teachers and professors utilizing the XP308i in some of the same circumstances as business professionals (presentations, audio playback), the system possesses some functions unique to music education. The unit is ideal for directing large instrumental ensembles. XP308i will help conductors keep even their percussionists on task. Thanks to it's integrated iPod dock, soloists and small ensembles can practice along with recorded accompaniment. Also, the XP308i's audio playback abilities make the analysis of recorded music easier, as well as a more interactive listening and educational experience. Beyond producing impeccable public announcement sound quality, the XP308i's elements of portability make it ideal for countless recreational uses. For a traveling instructor, the XP308i is perfect for leading exercise/yoga classes in fitness clubs. Outdoor functions pose no problem whatsoever for the XP308. Block parties, sporting events, and matters of crowd control now have a more practical, and still extremely portable, alternative to the megaphone. The XP308i is also sure to excite the tailgating crowd, now able to demonstrate their team spirit at a level never before possible, or simply provide musical entertainment for a classic tailgate party. 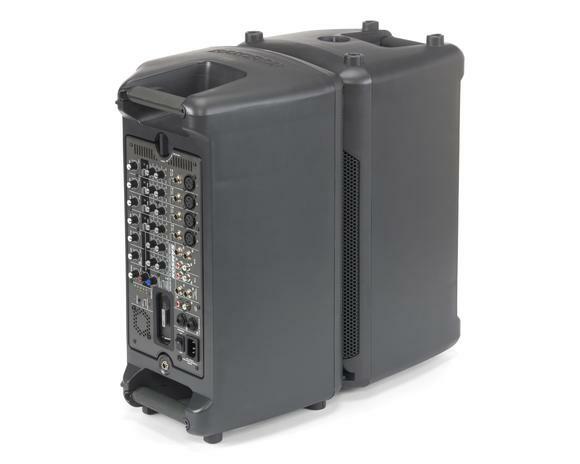 Expedition 308i is ideal wherever a smaller PA system and great sound are required. 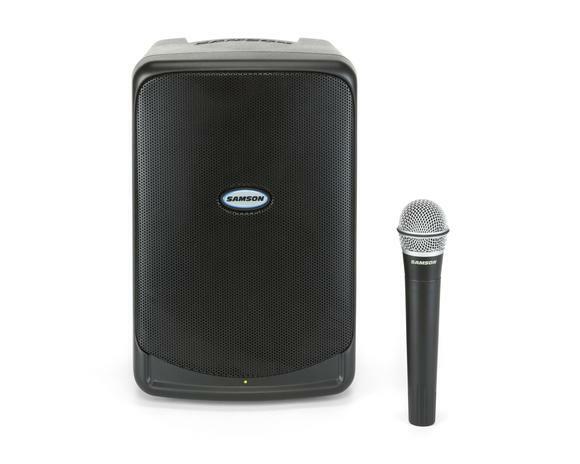 Samson makes public address simple with an all-in-one portable sound system that offers everything you need to deliver a professional and memorable presentation: The Expedition 40iw. To ensure pristine, full-range sound, the Expedition 40iw (XP40iw) employs a 6-inch woofer and a 1-inch high frequency driver. The unit features a 40 watt Class D amplifier that is perfectly matched to the driver for high efficiency and low current draw. It provides a built-in VHF wireless microphone system that's ideal for any number of vocal applications. An internal iPod dock with level control also gives you the option of incorporating songs or other MP3s into your performance. Plus, with bass and treble control you can tweak your sound to appropriately match your specific setting and audience. A rechargeable battery provides the XP40iw with absolute mobility. In addition, a 1/4-inch link in/out jack allows for linking two systems together to create a stereo setup. 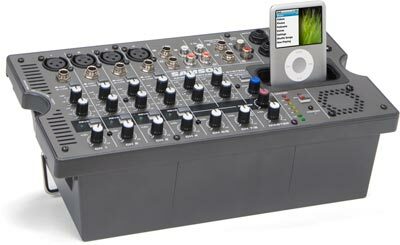 Lastly, as this stand-mountable PA is also extremely lightweight, it enhances the portability of the system. The XP40iw even has a convenient integral top handle for easier transport. 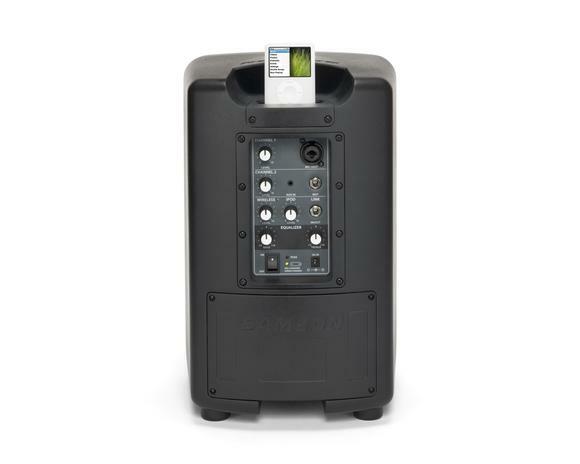 High-quality components, professional features and convenient portability make Samson's XP40iw a consummate single system solution to a wide range of public address applications, including tour groups, classrooms, conference/meeting rooms, health clubs, outdoor events and even small auditoriums. With the XP40iw, your voice will command the boardroom podium with as much authority as the main stage. The XP40iw provides the perfect solution for a business professional leading any sort of presentation. No matter the application, from PowerPoint presentations to company meetings and corporate events, you can convey your ideas in a clear, concise manner and perform your job better. You can even use the XP40iw's integrated iPod dock to playback audio clips in promoting a more interactive listening experience for any audience. Students, teachers and professors will find that the XP40iw possesses some functions unique to music education. Its built-in VHF wireless microphone system is ideal for directing large instrumental ensembles. The XP40iw will help conductors keep even their percussionists on task. Thanks to its integrated iPod dock, soloists and small ensembles can practice along with recorded accompaniment. Also, the XP40iw's audio playback abilities make the analysis of recorded music easier, as well as a more interactive listening and educational experience. Though the XP40iw was designed for providing quality sound reinforcement in public address settings, the range of musical settings that can benefit from the system's features is substantial. Whether you're a singer/songwriter gigging in a small coffee shop or a karaoke diva captivating the audience in a medium-sized club, the XP40iw will ensure your sound is well suited for your space. The XP40iw can also hold its own as a portable guitar amplifier. Simply plug your electric guitar and effects board into the XP40iw and you are ready to rock your hardest alongside your fellow bandmates or your favorite iPod playlist. Bring the music outdoors, as the XP40iw and an acoustic guitar are the perfect pair for a classic fire pit jam session. Wherever your guitar goes, the XP40iw goes. The XP40iw's portability makes it ideal for countless recreational uses. For a traveling instructor, the XP40iw is perfect for leading exercise/yoga classes in fitness clubs. Outdoor functions pose no problem whatsoever for the XP40iw. Block parties, sporting events and matters of crowd control now have a more practical, and still extremely portable, alternative to the megaphone. The XP40iw would be a particularly great addition to your backyard, ideal for providing musical entertainment during barbeques and pool parties. Given the convenient all-in-one functionality of the Expedition 40iw, making a professional and memorable public address has never been more fun and stress free. The MG100HFX amp head combines 100W of raw Marshall power with the versatility of 4 storable, footswitchable channels. You also get digital effects including: reverb, chorus, flanger, phaser, and delay. It packs fully analog tone circuits, providing the distinctive Marshall tone and pure organic flexibility. Using digitally controlled analog functions, the MG4 Series MG100HFX also delivers precise control and superb flexibility without masking your guitar's own sound or making your tone sound processed and artificial. The Marshall MG100HFX head also features a frequency-dependent damping circuit. This circuit ensures that the sound reproduces the same interaction between amplifier and speaker that occurs in professional valve amplification, making the MG100HFX amplifier sound and feel alive. A 2-button footswitch is included, but with a Stompware 4-button footcontroller (not included), you can easily store and recall your favorite settings, playing seamlessly through your music in true professional style. The 8-ohm, 120W MG412 speaker cab is loaded with 4 x 12" custom-voiced Marshall/Celestion speakers that really crank out that authentic Marshall tone. The guitar speaker is designed for maximum road-readiness with reinforced corners and recessed and side bar handles. Plug in, rock out, and wait for the cops to show up for disturbing the peace. Artists who have created groundbreaking work, toured every corner of the globe and inspired a whole new generation to pick up a guitar. No-one fits this profile better than Megadeth frontman Dave Mustaine. Now Mustaine and Marshall have teamed up to deliver the Dave Mustaine signature MG Microstack—the MG15FXMSDM or Megastack for short. Like the man himself, this solid-state amplifier demanded the best possible analogue tone while taking advantage of revolutionary digital control. The Marshall Megastack from the MG series was inspired by two different pieces of gear: the MG15FX Microstack, and the 1960DM Dave Mustaine signature speaker cabinet, which features a carbon-fiber covering, diamond-design grille, and lots of Mustaine-inspired tone. The esteemed guitarist worked intensively with the Marshall development team and created 4 main sounds as the default patches and hid 4 additional tones in the amp's memory. Dave Mustaine duplicated the main sounds of his touring rig, for a total of 8 channels: 2 clean, 3 rhythm, and 3 lead solos. These tone patches will almost perfectly deliver solo sounds to perform screaming guitar shreddage. Like all the guitar amplifiers in Marshall's MG range, state-of-the-art manufacturing and stringent quality control procedures ensure that the Marshall Dave Mustaine Megastack meets the high standard of build you have come to expect from all Marshall products. No matter if this is your first ever Marshall. 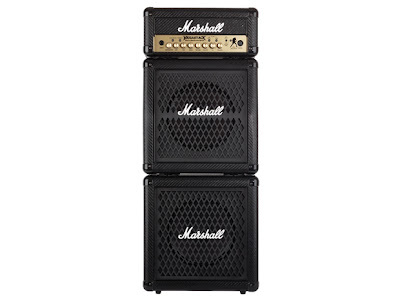 The tone, flexibility and feel of this compact and rugged Marshall stack is guaranteed to deliver the goods. The Clean/Crunch Switch selects between Clean (green) and Crunch (red) channels. The OD Switch selects between OD1 (green) and OD2 (red) channels. The Tap (Manual) Switch matches the delay FX time to the time between two pushes. The LED flashes at the selected delay time. Holding down the Tap switch for longer than 2 seconds switches the amp between manual and preset mode. When using the optional foot controller, holding both the Tap switch and the Store switch will activate the tuner. The Store Switch Stores the current amp settings into the current channel or into the optional foot controller. The Marshall Megastack Distortion Control controls the amount of signal entering the preamp and the amount of distortion created in the selected channel. The Reverb Control lets you add a lush reverb to the selected channel, from a subtle hint to cavernous and all points in-between. The FX Control selects and adjusts one of four effects: Chorus, Phaser, Flanger, and Delay. The Low Control adds warmth and low-end depth to your sound, the Mid Control will vary the amount of body in your sound, and the High Control will make your sounds brighter and more cutting, turning it down will decrease your tone's edge and make it sound softer as a result. The MP3 Line In lets you jam to your favorite MP3, CD, or tape track by connecting a line or headphone output. Adjust the volume of your player to match that of your guitar and you've got the perfect 'playalong' practice system. The Headphone socket (stealth Mode) is helpful for use when silent practice is the order of the day. Connection of Stealth Mode will automatically mute the internal speaker. 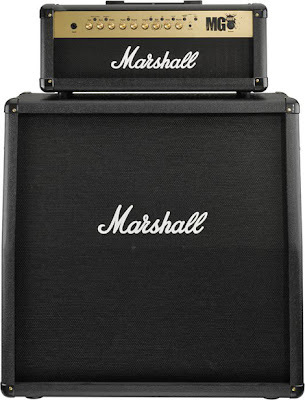 Finished in the same distinctive style as the Marshall 1960DM Signature Dave Mustaine speaker cabinets, the MG15FXMSDM makes for a menacing microstack indeed.